Make Old Linoleum Look New Again! To avoid this problem all together, it’s recommended that a linoleum floor be protected with a water-based sealer or finish. 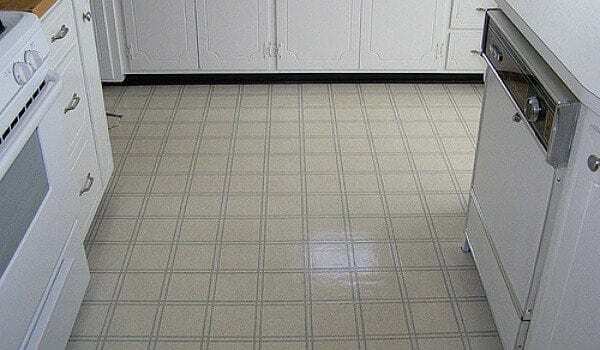 Without this protection, using harsh chemicals can damage or yellow a linoleum floor. After thoroughly cleaning the floor, apply a medium coat of a sealer or finish and allow to dry. If your linoleum floor is suffering from dark scuff marks, head to your closet: By rubbing a tennis ball against the scuff marks, they’ll magically disappear. If you don’t have a tennis ball handy, a pencil eraser will also do the trick. Of course, using an eraser on a large floor is almost as bad as using a toothbrush. Actually, it’s probably worse. So you can always opt for a sponge and dish-washing detergent instead. One of the most popular ways to clean a grimy linoleum floor is a solution of ammonia and water. If you do choose to use ammonia, be sure to keep the room well ventilated and consider running a fan while it dries. If you would rather use a safer alternative to ammonia, there are plenty of all-purpose cleaners available. Consider using an environmental, pH-neutral cleaner to get the job done. If the floor is in need of a lot of care, you may also consider using a floor polisher or a floor buffer to get the shine you’re looking for. If the floor is really bad, you can rent a commercial or professional machine from your local hardware store. When your floor is all finished and clean, it’s time to add a fresh coat of wax. Mop and Glo, or another brand of high quality wax, will help restore the shine. Once the floor is dry, you may apply a coat of wax. When the wax is dry, the linoleum will shine like new again. By following these steps, an old linoleum floor can be restored to look good as new. Spending a lot of money isn’t necessary. After all, the cost-effectiveness of linoleum floors is one of the reasons they’re so popular. So don’t spend the big bucks on a new floor when the solution is right in your home already.